Ultimately, what Better Media becomes will depend on what our contributors collaboratively do and decide together. We want a more diverse, democratic and accountable media, but how can we get there? In addition, it seem pretty obvious that we need to focus much more on reining in the Tech Giants who arguably have more money and power than any human organisations have ever had, ever, with huge implications for democracy. Given the fact that a handful of corporations dominate UK media the MRC and CPBF manifesto argues for the introduction of “ownership caps across the total media market, as well as in separate markets for national and regional news, so that no single voice can control more than 20 or 30 per cent of a designated media market”. It goes on to suggest that “any publisher with a 15 per cent share in a designated market should be subject to a Public Interest test in respect of any merger or takeover”. Is that too much to ask? We don’t think so. As a start let’s all get behind MRC’s Draft Media Plurality Bill: read it, discuss it, improve it and then work together to make it law. When even the “sham” self-regulator IPSO found The Sun’s ‘Queen Backs Brexit’ Front Page headline to be “significantly misleading” their editor Tony Gallagher said he would do exactly the same headline tomorrow. Not too surprising then that a report by DEMOS and the Carnegie UK Trust found that 63 per cent of people believe the public should have more of a say in the regulation of the UK media. 71 per cent want to see an independent regulator in place to adjudicate on press complaints and 77 per cent want an independent regulator involved in setting guidelines. As a start, perhaps implement the Leveson recommendations (.pdf) originally agreed by a large cross-party majority, and widely supported by the public too. Hacked Off do some great work campaigning on this and we should support them in their efforts. Some have argued Leveson’s proposed scheme could never work and that what is needed is “a tribunal of some kind, which can operate independently but must have statutory authority and be established by law”, butthe arrangements for press self-regulation put forward by the Leveson in 2012 are undoubtedly better than what we have today. We also need an effective right of reply, a “conscience clause” that enables journalists to refuse to work unethically and all media workers must have the right to union recognition. We could start by reclaiming and radically reforming the BBC? We’re told the BBC is ‘too big’. Yet Britain is part of a Europe-wide trend where funding for public service media is shrinking, while commercial revenue grows. Creeping privatization must be reversed so that the BBC can be a central resource for developing and promoting digital public media for the 21st century. Stricter obligations should be imposed on the commercial public service broadcasters relating to levels of investment in original programming and the nature and range of programming at peak times, and all providers of broadcasting content should meet public service obligations once they reach a certain threshold of market share. Journalists and the public are at risk from state surveillance. There is also a growing threat from private companies whose business models are based on economic surveillance, gathering information on users as a commodity for marketing purposes. The Facebook/ Cambridge Analytica scandal has highlighted some of these issues, but do you know how much Facebook’s record fine for mishandling the data of 87 million people cost them? Just 15 minutes of profit. Neither the state nor private interests can be trusted to safeguard peoples’ communication rights. These rights include access information and services, privacy and freedom of expression. A major threat to free media lies in anti-terror and surveillance laws to harass and spy on journalists and put the confidentiality of their sources at risk. This threatens investigations into vital areas of public interest and the laws must be changed – notably the Regulation of Investigatory Powers Act that allows police to bypass secretly the proper procedures. The Open Rights Group are the leading UK organisation working on these issues. Join them now. The political agenda is being set more and more by lobbyists for powerful interests and corporations. As an example, Rupert Murdoch and News Corp execs met with the UK Prime Minister 26 times between Jan 2015 and June 2017. The Commons Public Administration Select Committee has concluded that “there is a genuine issue of concern that there is an inside track who wield privileged access and disproportionate influence”. As Unlock Democracy and SpinWatch have argued for for some time there should be a robust public register of lobbying. Clandestine lobbying should then be outlawed and a fund established to allow civil society groups to carry out research in the public interest. There should be restrictions on the ways that politicians, former civil servants and media executives move effortlessly and influentially between different parts of the industry, making a complete mockery of the regulatory process. Of course, Brexit aside, lots of laws and regulations are made in Europe and so it’s also worth checking out the Corporate Europe Observatory who expose the power of corporate lobbying in the EU and have a gathered a handy selection of online tools to help investigate corporate lobbying, including SpinWatch’s excellent Powerbase guide to networks of power, lobbying, public relations and the communications activities of governments. More than half of the world s biggest and most powerful corporations are tech companies, and they have more data about you than ever before. Platform capitalism is surveillance capitalism. Martin Moore’s excellent study Tech Giants and Civic Power (92pp .pdf – nice except here) is all about the reletively new and growing phenomenon of global tech giants, their increasing civic power, and what this means for democracies. The CPBF organised a great Meetup entitled Tech Giants – what to do? featuring Martin, plus IF founder Sarah Gold – but whilst we all left with a far greater understanding of just how people the Tech Giants are, none of us really had any idea of what to do about it! One proposal from the MRC is to levy them to make them pay for public service reporting. A strong, self-confident government could negotiate with these tech giants to create a fund, run entirely independently, to support public interest media. Google and news publishers in France and Belgium were able to agree a settlement. If we can’t do something similar here, but on a more ambitious scale, we’ll need to look at the option of a windfall tax on the digital monopolies to create a public interest media fund. Another approach is to try and compete (or out-cooperate) the tech giants by forming Platform Co-ops. Check out the website of the Platform Co-op Consortium, read Ours to Hack and to Own: The Rise of Platform Cooperativism, A Vision for the Future of Work and a Fairer Internet, explore the Internet of Ownership directory, get along to the next Open Co-op conference in London, follow #platformcoop on Twitter (and, on Social.coop too, of course 😉 ), and keep an eye on CoTech, a network of UK tech worker co-ops. Either way, we have to do something. Because as the editors of recent book Digital Dominance: The Power of Google, Amazon, Facebook, and Apple made clear at the launch event “we are condemned to act; doing nothing is not an option” – so please join Better Media now and together we can build the large scale democratic movement for media reform the UK so urgently needs. 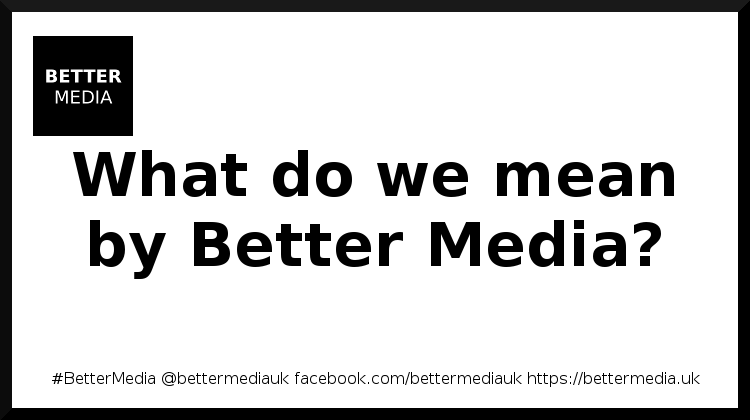 Previous: Previous post: Why do we need Better Media? Next: Next post: How will Better Media work?